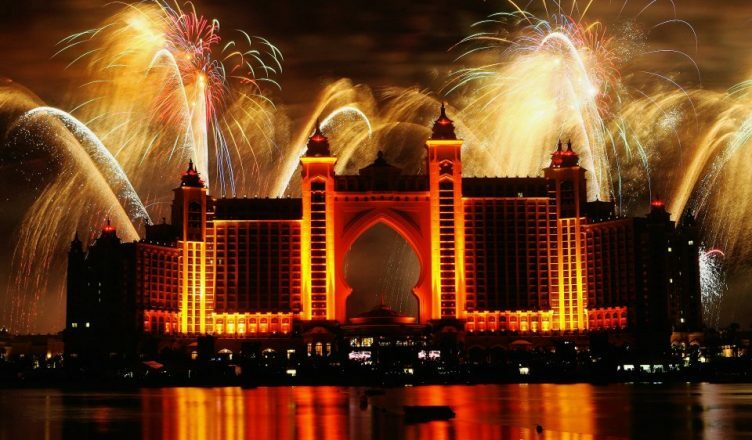 Dubai ticks all boxes when to come to New Year celebrations with each year being more splendid than the last one. Get ready to savor fabulous choices with several entertainment venues and restaurants offering attractive packages for the New Year. Also, several renowned artists performing live concerts at various destinations attracting people from all over the globe. Tourists and guests can choose from a wide variety of celebrations at various iconic landmarks like the Burj Khalifa, Palm Jumeirah, and much more. The highlight of the New Year celebrations is the iconic New Year’s Eve fireworks. We have listed some of the best places to catch the fascinating New Year celebrations. 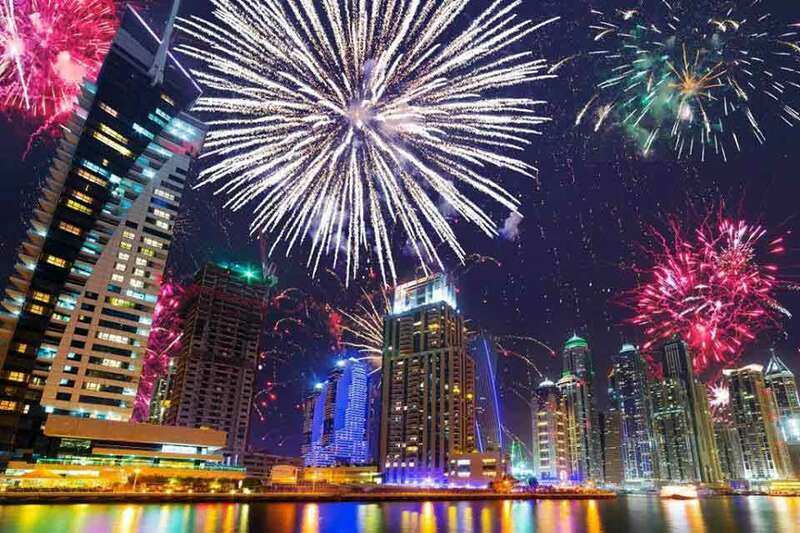 If you are not satisfied with just watching fireworks at midnight and want to do something exciting on New Year’s Eve, here are some of the exciting parties that you can attend in the city of Dubai. This is the best way to have a fun evening and at the same time view the numerous fireworks across the city. Yes, we are talking about the dhow cruise on either Dubai Marina or Dubai Creek. The dhow cruise gives you the chance to sail on the traditional dhow (turned restaurant) and enjoy a delicious international buffet dinner, some live music, entertaining programs and great view of the city. Moreover, as the clock strikes 12, you would be rewarded with amazing fireworks and New Year cake served with fruit champagne. 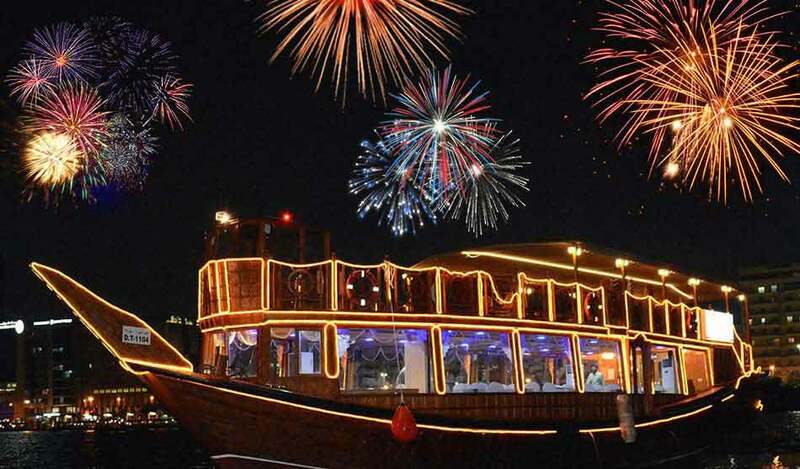 This is surely the most unique Dhow Cruise New Year’s Eve party in Dubai for 2019. If you want to stay away from the crowds and traffic jam of the city during New Year’s Eve but do not want to spend your evening at home, going to the desert would be a great option. 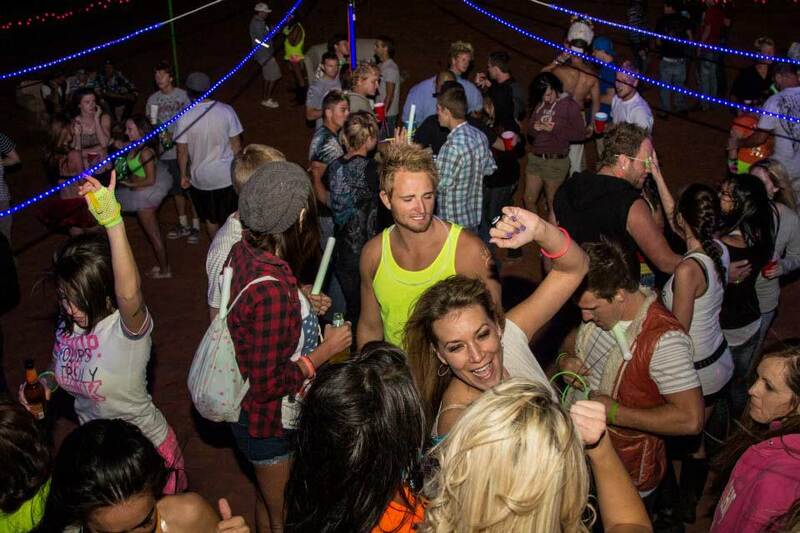 Several desert safari companies offer New Year’s Eve parties that are relaxed and laid-back and yet lot of fun. At the desert, you would get to spend the last day of the year amidst a bonfire enjoying the scrumptious BBQ dinner, live entertainment programs, belly and Tanoura dance performances, unlimited refreshments and drinks and lot of other fun activities. If you want to have a low-key celebrations and at the same time have a memorable evening, then there is nothing better than the desert party for you. If you want to be in the thick of fun and frolic, there are some amazing celebrations at every nook and corner of Dubai city. However, if you want to know about one of the best New Year parties in Dubai, it would undoubtedly be at Atlantis, the Palm. The gala is hosted on the beach where people can enjoy free-flowing champagne, all night alcoholic and non-alcoholic drinks, lobster and caviar as well as smoked salmon and sushi. Then there are the live bands and other entertainment programs. Kids also have a separate area where they can indulge in interesting and fun activities. The party begins at 7:30 PM and goes up until 3 AM and guests are requested to dress-up for the party. 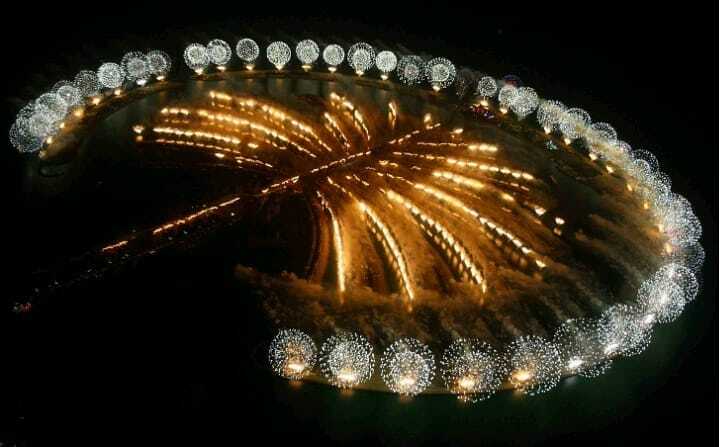 The best thing about the party is that it would give you the best view of the fireworks on Palm Jumeirah. The mighty Burj Khalifa footsteps provide enchanting views of the fascinating fireworks in Downtown Dubai. 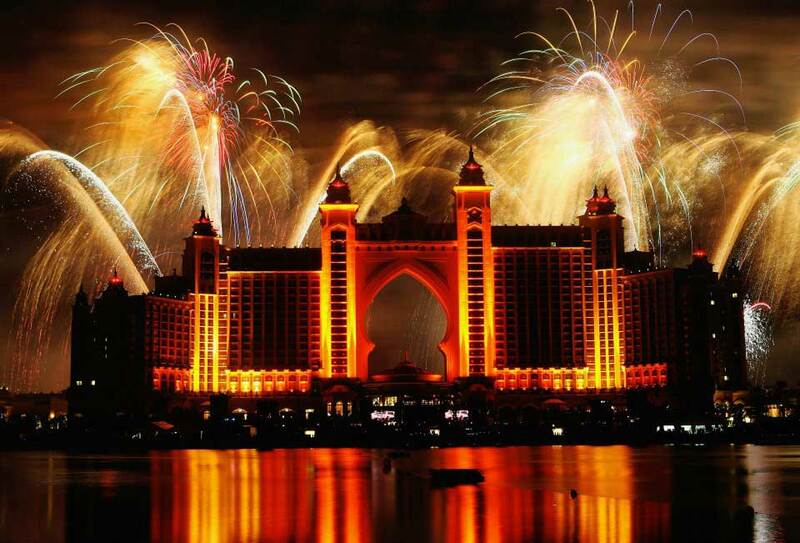 Several people gather each year along the waterfront of the Dubai Fountains to witness the fabulous grand fireworks. Arrive early to catch the best seat in the house; the top spots are full by 6 pm. Even the restaurants that offer a fantastic view of the NYE fireworks get booked rather quickly. The roads that provide access to the Downtown area are restricted for the night to control the flow of the crowd. Standing right opposite to the Dubai Mall on the other side of the bridge is Souk Al Bahar. A favorite dining and lifestyle spot. 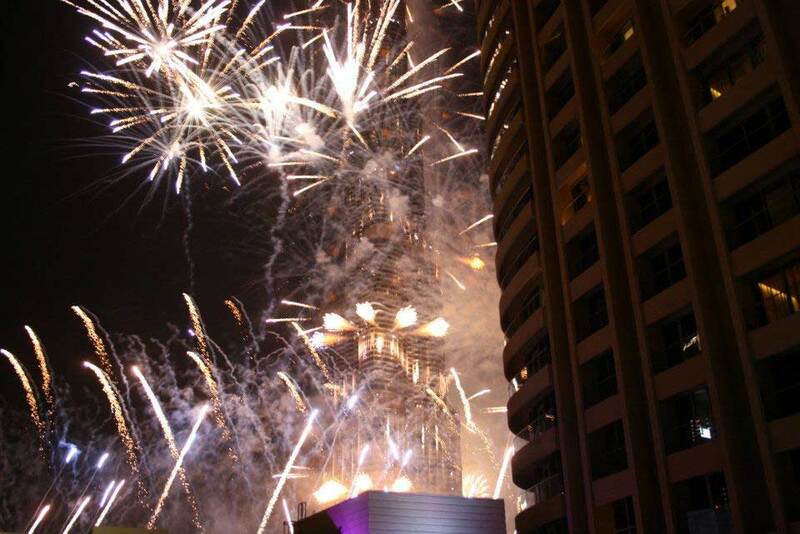 The Souk Al Bahar houses several restaurants that offer stunning views of the NYE fireworks at Burj Khalifa. You can avoid last-minute disappointments by booking well in advance. The tall skyscraper in the neighborhood of Downtown Dubai is the Business Bay. Enjoy mind-blowing panoramic views from this spectacular landmark in the region. The Business Bay features an array of world-class hotels like the Taj Dubai, JW Marriott Marquis, The Steigenberger, and The Oberoi offer the perfect vantage points to witness the exciting action. The Vault and the Eloquent Elephant provide enchanting views of the grand fireworks from the top. Move beyond the Souk Al Bahar is the open air Burj Plaza. Another favorite spot to witness the fascinating NYE fireworks at the Burj Khalifa. Several families gathered at this place on New Year’s Eve. 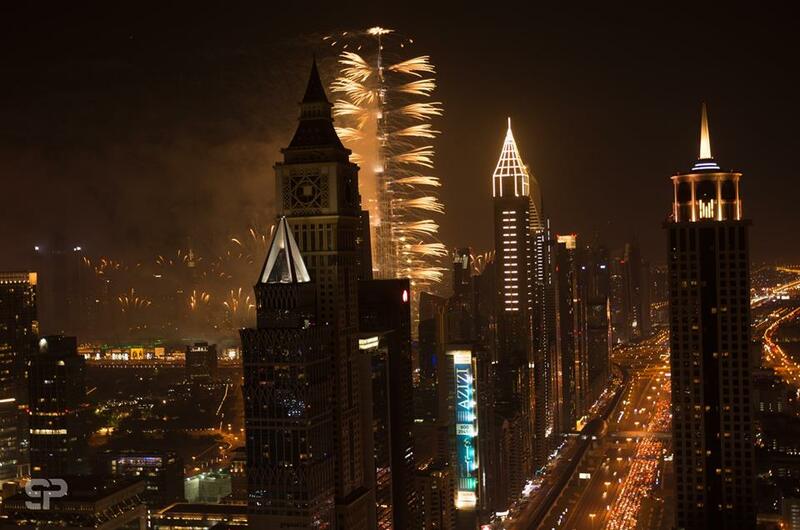 The latest addition to the impressive landmarks of Dubai offers alluring views of the NYE fireworks. Witness the mesmerizing Dubai skylines like never before. The Dubai Water Canal comes with a 3.2-kilometer spread waterfront and is a perfect spot for families and friends to gather up for any special occasion. In the neighborhood of the opulent Sheikh Zayed and the beach, the City Walk is a fun and entertainment center in Dubai. Modeled in the shape of the iconic Burj Khalifa along the central walkway, the City Walk boasts of several eateries, entertainment hotspots, and loads of fun and leisure for tourists and visitors. Enjoy the carnival-like atmosphere on New Year’s Eve. This busy and luxurious road strip decorated with a bunch of tall skyscrapers and five-star rated hotels. Enjoy dazzling views from the top. The best spots to witness the grand Burj Khalifa NYE fireworks on this road are Vii Lounge at the Conrad, 40 Kong at The H Hotel, and Level 43 Lounge at Four Points Sheraton. 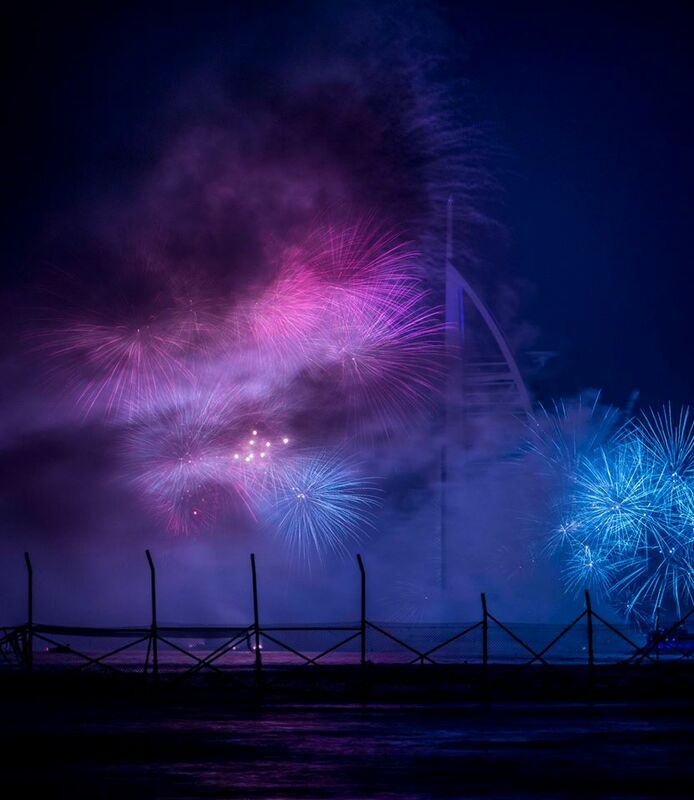 The Meydan Racecourse may be a bit far from the Burj Khalifa, but it offers a staggering view of the NYE fireworks. 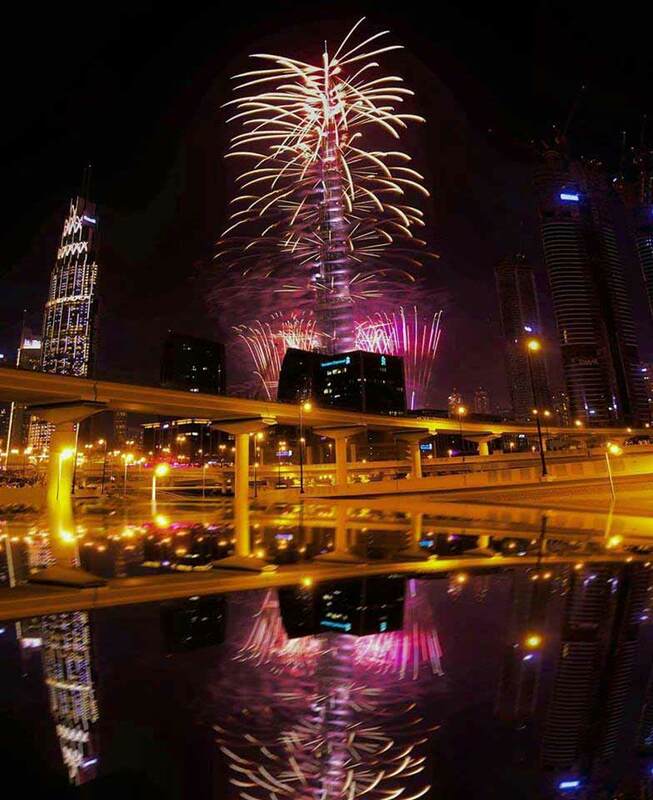 Another secret spot to catch the best seat for the NYE fireworks is Nad Al Sheba cycling track, and the patch along Al Abraj Street in the Business Bay Area. It is difficult to miss the stunning fireworks display from these beautiful star attractions. In the neighborhood of the Burj Al Arab, the Kite Beach or the Jumeirah Beach offers an enchanting view of the NYE fireworks at Burj Al Arab. Grab a spot early as the rush intensifies post evening. Carry some eateries along and a blanket to check out the mesmerizing sunset followed by the grand fireworks at midnight. There are also several eateries or shacks on the beach where you can grab a quick bite while enjoying beautiful views in the background. A modern outlook to the traditional souks lies at the footsteps of the Burj Al Arab. There are plenty of restaurants, lounges, open spaces where you can enjoy unobstructed views of the show. Enjoy panoramic views of the grand fireworks that will surely enlighten all moods. 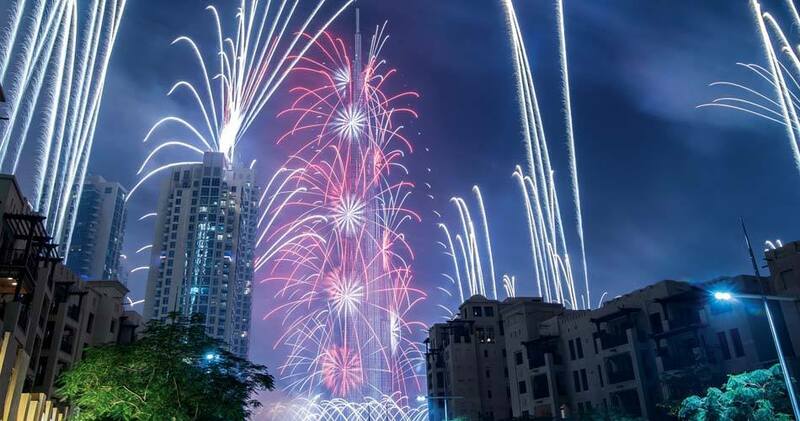 The JBR Beach hosts its fireworks from the water at New Year’s Eve followed by numerous carnival-style activities and celebrations the entire evening on New Year’s Day. The opulent beach has plenty of restaurants and other entertainment spots to garner attention from all age groups. This virgin sandbar placed in the backyard of the Knowledge Village offers enchanting views of the Burj Al Arab and its grand fireworks. One of the rare spots where you can also witness two fireworks at the same time; the Burj Al Arab fireworks and the Atlantis fireworks. The source of the grand fireworks offers the best seat in the house. Book a room at the opulent Atlantis hotel and grab a spot at the New Year’s Eve Royal Gala to catch the mesmerizing fireworks at the source. The 11-kilometer stretch boardwalk placed along the crescents of the beautiful Palm Jumeirah and is considered the best spots to witness the action live. 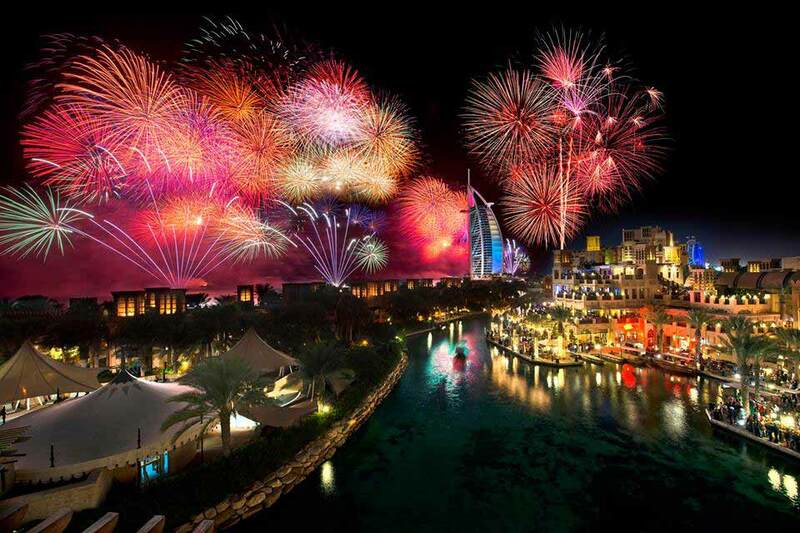 The Rixos end offers fantastic views of all three fireworks; Burj Khalifa, Burj Al Arab, and the Atlantis. Grab a spot as early as possible as the entry is restricted to control the flow of traffic on New Year’s Eve. 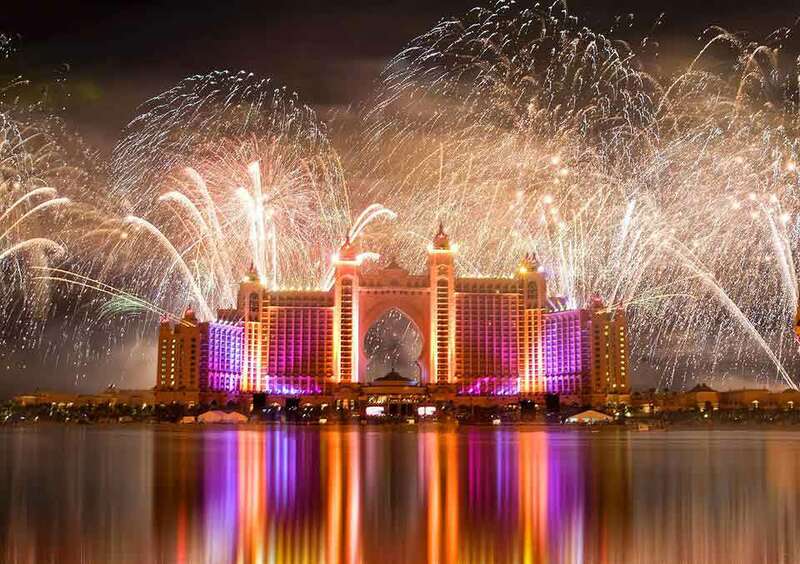 There are an array of hotels situated on the Palm islands like the Jumeirah Zabeel Saray, Rixos, Anantara, Kempinski, Waldorf Astoria that are prime spots to witness the grand Atlantic fireworks. If you want to dance all the way into the New Year, you do not have to stick to the regular New Year parties. Instead, go clubbing! 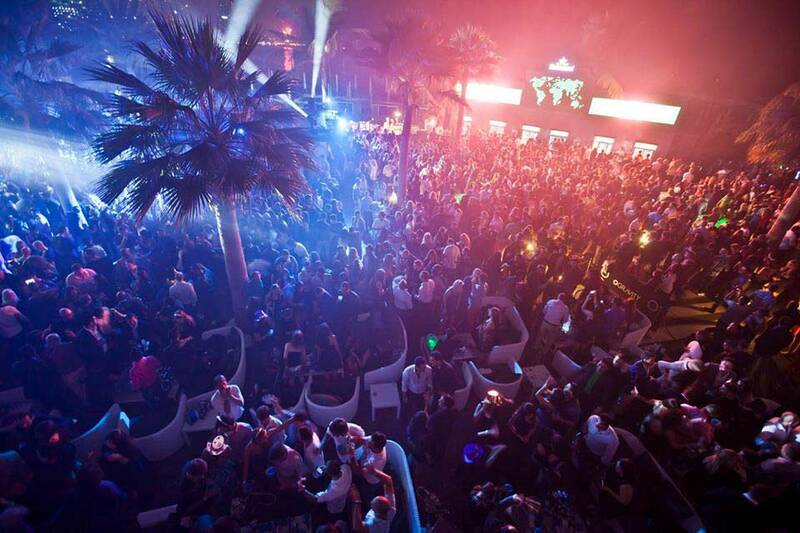 Dubai offers some amazing parties at its various clubs, all around the city. 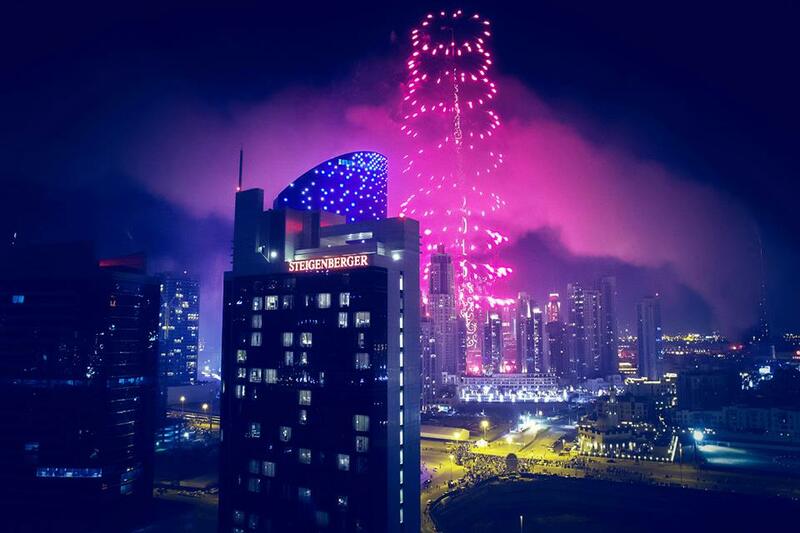 Here are some great spots for Dubai New Year’ Eve 2019 parties. a)Zero Gravity: You can expect great food and drinks and the view of fireworks at Zero Gravity, which hosts one of the biggest New Year’s Eve parties in Dubai. However, what keeps it apart from the amazing parties of Dubai is the enthralling music. You can expect a world-renowned DJ at the Zero Gravity who would want you to dance throughout the night. But do not forget to take a break to enjoy the food, the company of your family or friends and also to witness the record-breaking fireworks. 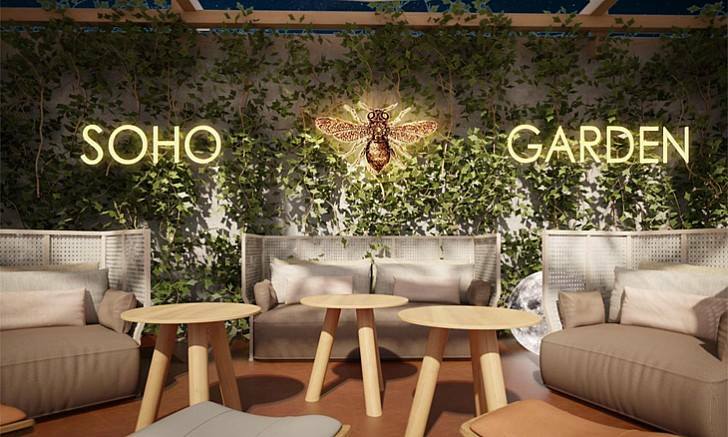 b)Soho Garden: Welcome the New Year by dancing to some eclectic music at the Soho Garden. Offering pool lounging, exciting nightlife and gourmet dining experience, New Year’s Eve at Soho Garden is like no other. The music and the vibe of the place would create a mood that would leave you energetic and excited for the whole night. What’s more? 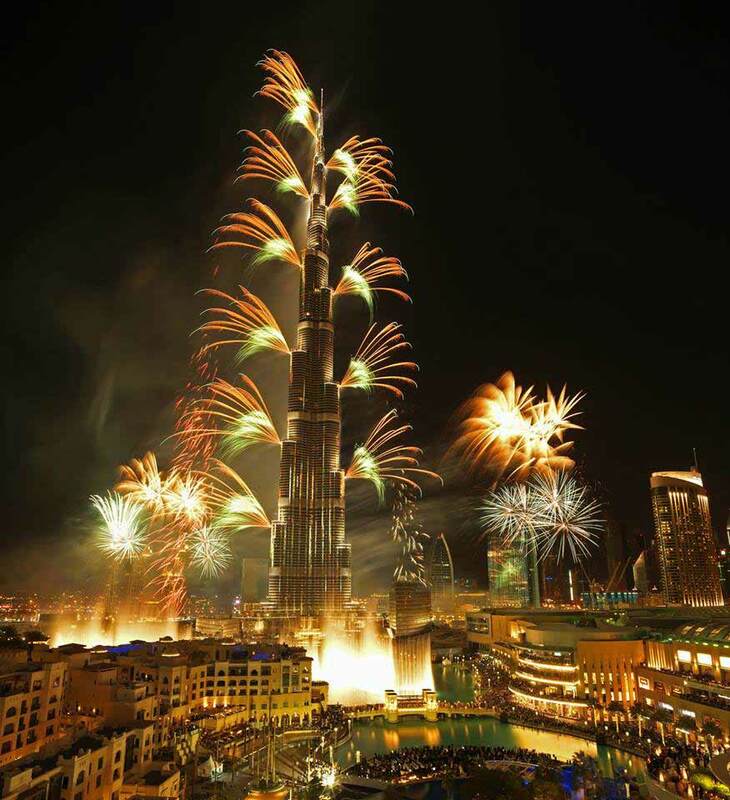 It is a great place to watch the fireworks of the Burj Khalifa. Few other clubs that throw the best New Year parties in the city are Candypants, El Chiringuito, Inner City Zoo, Lucky Voice, White, etc. 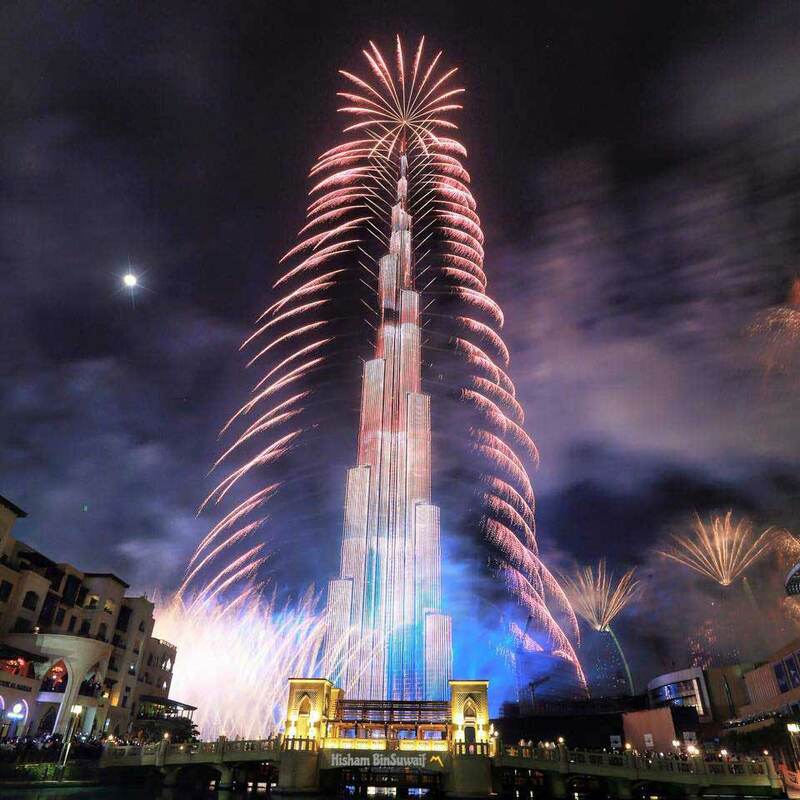 As mentioned before, the Burj Khalifa fireworks are one of the most awaited New Year celebrations in Dubai. But if you do not want to be uncomfortable standing at a good spot for hours, it would be a good option to book a table at the nearby restaurant. This way you can relax and enjoy a good meal while waiting for the fireworks to begin. a)Karama Kafe: The Karama Kafe is known for its beautiful interiors and the spectacular views of Burj Khalifa and the city of Dubai. Although the restaurant offers terrace, private lounge and indoor dining, go for the terrace one if you want to see the fireworks at midnight. Also, it would be a good idea to make your reservations early to grab the coveted terrace dining option. Apart from the fireworks, you would be rewarded with the delicious 5 course gala dinner on New Year’s Eve at karama Kafe. b)Cabana: Cabana is a part of The Address, which is located inside the Dubai Mall, which is next to Burj Khalifa. While the fireworks are surely a bonus for those celebrating New year’s eve at this restaurant, they would also be able to enjoy delicious cocktails, sizzling barbecue counter, several rounds of shisha and lot of entertainment with games and music, making your night amazing and memorable. The restaurant is a bit expensive but worth every dirham you spend. Dubai Opera, Carluccio’s, The Noodle House, Serafina, etc. are a few other restaurants that would give you a good view of the Burj Khalifa fireworks. 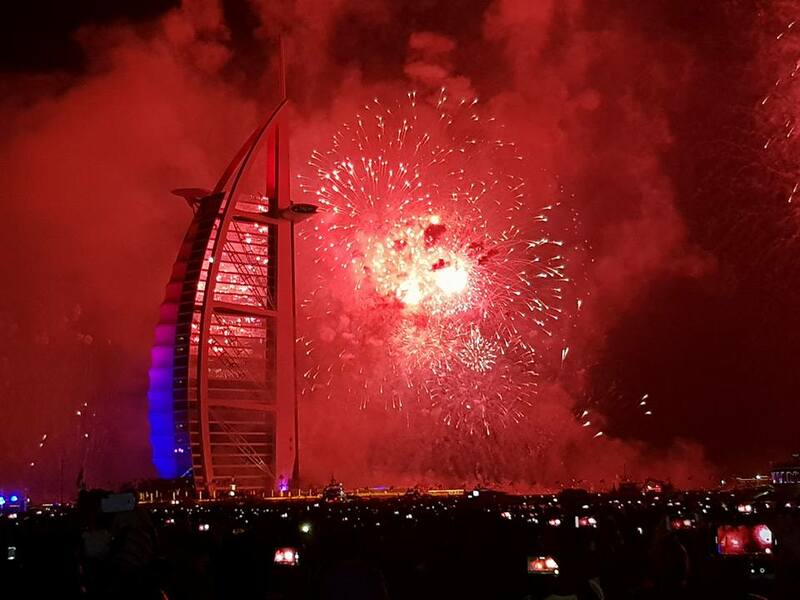 With the knowledge of the exciting Dubai New Year’s Eve 2019 events, you are all set to have an unforgettable time in Dubai. If you are planning to go to a restaurant, nightclub, hotel, or even a desert camp on December 31, it is important to book early to avail early bird discounts. This would also make sure that you get a reservation at a place that you would enjoy the most.